Tune in to NHPBS Saturday, ­­­­April 14 at 6 pm as Plymouth Regional High School takes on Manchester Central High School in the quarterfinals of Granite State Challenge. Playing for the Plymouth Bobcats are captain Richard Lyons, Rhys Harris, Konner Bird, and Martin Runquist, as well as alternates Lydia Mardin and Clayton Titus. They are coached by Jay Fogarty and Troy Harris. The Manchester Central Little Green are represented by captain Tamsin Weissberg, Connor Hamel, Karishma Manchanda, and Declan Knieriem, with alternates Monericka Semeran and Maxwell Nakos. They are coached by Lorraine Meyette. 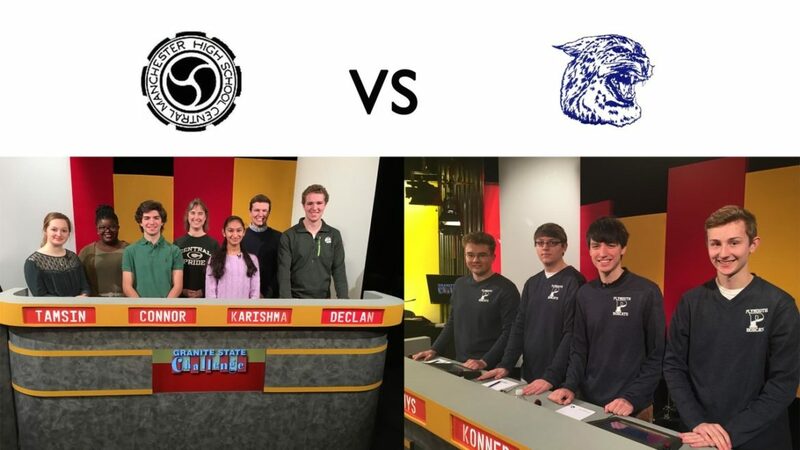 Hosted by Jim Jeannotte, Granite State Challenge features New Hampshire’s top high school academic quiz teams as they demonstrate remarkable teamwork, quick thinking and smarts to beat the clock and buzz in first on this iconic New Hampshire game show. The game emphasizes quick recall of math, science, social studies, language arts, and fine arts facts—along with questions about current events, entertainment, sports, and New Hampshire. Granite State Challenge is funded by lead sponsor Unitil; with additional funding from NEA New Hampshire, Heinemann Publishing, New Hampshire Lottery, D.F. Richard Energy, HRC, Measured Progress, The NHHEAF Network Organization and Super Sunday partner, Manchester Community College.